ImTOO MP3 WAV Converter is powerful WAV to MP3 converter and MP3 to WAV converter software to convert WAV to MP3, MP3 to WAV, convert audio to MP3 and WAV, and convert MPEG, WMV, ASF, MP3, WMA, WAV, M4A, AAC, OGG and AVI to MP3 and WAV. The MP3 to WAV converter provides you easy ways to convert MP3 to WAV file with high conversion speed. ImTOO MP3 WAV Converter provides completed ways to convert WAV to MP3, convert MP3 to WAV, and convert all popular audio files to MP3 and WAV. The WAV to MP3 converter also supports converting MP4, MP2, WMA, M4A, AAC, OGG, APE, VQF. As an MP3 to WAV converter, ImTOO MP3 WAV Converter can extract MP3 and WAV files from video files like AVI, MPEG, MPG, WMV and ASF. The MP3 to WAV converter provides optimized settings which can be set up to meet your demands. It supports reserving ID3 tag and batch conversion as well. 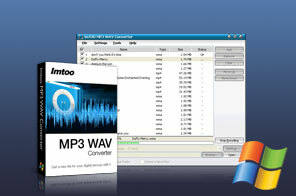 ImTOO MP3 WAV Converter can convert MP3 to WAV format and convert WAV to MP3 music with high speed. Convert audio files like MP3, MP2, WMA, M4A, AAC, APE, VQF, OGG, AU, AIFF to MP3, MP2, and WAV. Convert MPEG, MPG, WMV, ASF to MP3, MP2 and WAV; convert AVI to MP3; convert MPEG to WAV. Convert MP3 to WAV and convert WAV to MP3 in batches, that is, convert multiple files to MP3/WAV one by one. Provide you with three encoders: Lame MP3 Encoder, ImTOO MP3 Encoder, ImTOO WAV Encoder. Option of setting encoder property like bit rate, channel, sample rate, quality, compression, VBR and ABR. Copy between ID3v1 and ID3v2 tag and reserve all ID3 tags in the original files after converting audio to MP3. Freely edit ID3 tag info like title, album, artist, URL, genre, year when converting video and audio to MP3. The WMA to MP3 converter allows you to drag & drop file, specify output path, and queue music files. Offer several interface languages: English, German, Chinese and Japanese. Burn music on CD, burn music CD from popular video and audio files.